I started thinking about telling the stories behind some of my favourite photos, and while a photo may be worth 1000 words, they aren't always my words. Don't get me wrong, that is one of my favourite things about photography — the freedom to interpret an image in a personal way — but there are some photos that have personal meaning behind them, and I'd like to share some of those stories. So this seems as good a place as any to begin. I took this photo in a shopping mall called Canal City in Fukuoka, Japan. It was June or July of 2001, and very hot and humid. My girlfriend at the time and I had decided to spend extra time in Fukuoka as we had really fallen for the nighttime noodle cart scene along the canal near the central train station. 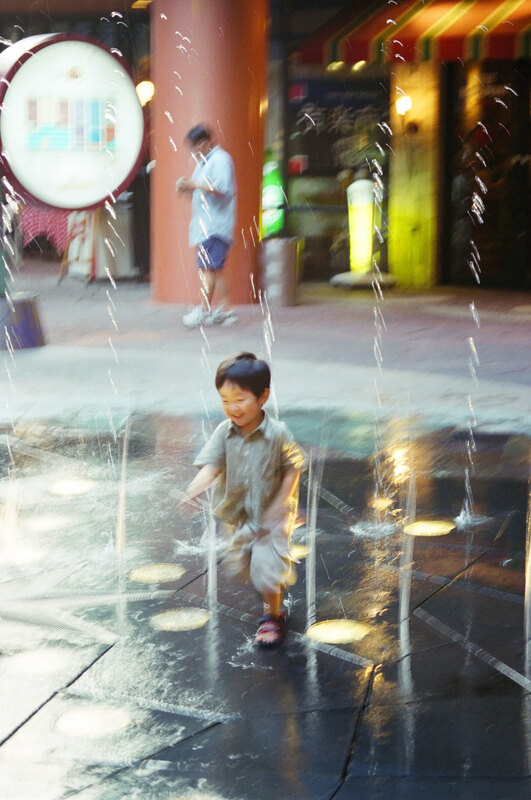 This little boy was playing in the fountains spraying water up from the ground, and I couldn't help but get caught up in his enthusiasm. I had my camera with me, a Minolta XTsi 35mm film SLR camera (nothing fancy), and snapped a few shots. It was at a time long before I had grown self conscious or sensitive about taking people's pictures, so I naively snapped away. And by snapped away, I mean I took a few photos, not like now where I would have taken 50 in the same time frame. At this point I was a seasoned amateur, having spent many rolls of film and hours in the darkroom, but I had no idea what the results of my snapping would be. Probably a month or so later I would see this photo in print — anticipating how it would turn out every day that the film sat in my x-ray proof film bag. To this day it is still one of my favourite photographs. One, because it captures a moment in time filled with emotion. Two, because it was the first time that I had felt any real emotion toward a photograph. Perhaps it was the first time that I had taken a photograph that wasn't purely technical. I hadn't thought about technique, or exposure, or anything. All of those lessons and technical shots I had taken before just manifested themselves in a way that was intuitive. Ultimately, I think it was the first step toward a career in pictures. I wonder where this kid is now? He must be 20 years old. What is he doing? Where does he work? Pictures can inspire a mountain of thoughts and feelings.